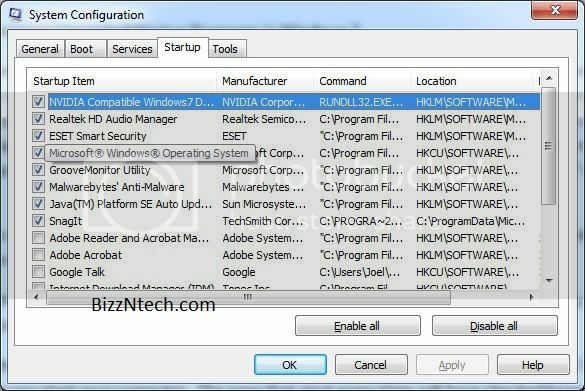 So, here’s a simple and easy way how you can remove unwanted startup programs in Windows 7 and improve the startup speed. Click on the Start button and in the search bar type ‘msconfig’ and hit enter. This will bring up the System Configuration Window. Click on the Startup tab. Here you’ll be able to see the programs or applications that load/ startup whenever you start your computer. The ones that start every time will have checked boxes. If you don’t want the program to start when you start your computer then simply uncheck the box. Programs that should be unchecked include programs like Winamp, VLC, live messenger, Skype, Adobe reader, etc. Don’t uncheck programs like Antivirus, display driver, audio driver, etc. Once, you’re done with unchecking the boxes, click on ‘Apply’ and then ‘OK’. Now, you’ll be prompted to restart. You can restart immediately or maybe later by clicking on ‘later’. Once, you reboot you should see the difference on the startup. There will definitely be a huge difference.